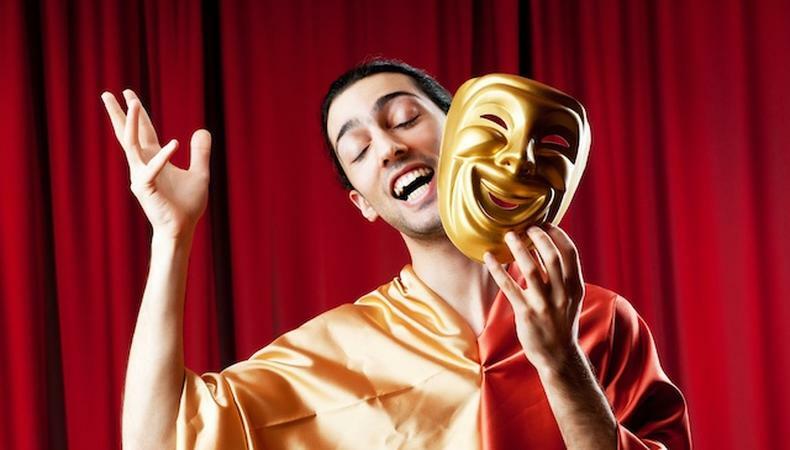 Most stage actors are unskilled—but not when it comes to singing and dancing. In the United States alone there are nearly 8,000 private studios and hundreds of colleges offering training to tens of thousands of dancers and singers. Double-threat talent is now commonplace, and no professional musical production in the major markets has difficulty finding proficient singers and dancers. Yet when creative teams give book scenes to callback finalists (otherwise known as audition sides), most readers possess very little technique with text. They don’t know how to act it on the same level of their musical skills. Get ahead of the competition by making regular practice of the following six exercises, and you’ll be well on your way to an effective dramatic performance. 1. Read aloud 10 minutes everyday. When offered new text at auditions or in rehearsal, most performers stumble for the same reason: They don’t possess the facility to read easily and expressively off the page. Whereas reading is a mental exercise, reading aloud is both mental and physical. Newcomers to this practice frequently skip over text, lose place on the page, or run out of breath before thought’s end. They stammer and trip over lines rather than speak speeches trippingly on the tongue. These problems are compounded under audition pressures. If you’re new to reading aloud, regular practice will double your facility in a week, and double it again in a month. Novels are excellent practice because they contain dialogue and dramatic storylines. Autobiographies and newspaper editorials are in essence monologues, and like characters, authors use specific and strong points of view. Children’s stories or young adult books are a good way to begin. 2. Ask questions and avoid making statements on all dialogue. Speak with inquiry rather than proclamation. Don’t state facts. Don’t drop sentence or thought’s end. Avoid throwing speech endings “down”—the most common (and deadly) mistake in performance. Instead, at commas, periods, and question marks, toss speech endings up. This technique is also known as “passing the ball,” “checking-in with the listener” or “the up inflection.” When performing scene work, ask questions (or demand response), and then be riveted to your scene partner’s answers! Practice reading relaxed while sitting, standing, and walking. Check that body parts (shoulders, hands, neck, jaw, toes) are not tightening. Perform simple tasks while reading. You’ll be doing the same when auditioning or rehearsing. Avoid repeated gestures (or any gesturing, for that matter). As is often the case in acting, when reading aloud, the voice should always be more expressive than the body. Don’t continually bob or move about. Find stillness. Take it easy…realx. 4. Pick up your cues. When auditioning, most performers think then speak. Real people rarely hesitate before talking. Do the same. Mimic the human condition. Drive through speeches “in one” using one breath. On longer speeches, use a series of catch-breaths (quick breathes) to make speeches seem “in one.” Make one choice rather than many, and keep that choice until the text forces you to change tactics. Speech techniques used in classic film are far more akin to dramatic performance than modern film acting. Watch Turner Classic Movies. Notice how actors drive through speeches using one choice. Watch how they act “on” the line rather than before, between, or after it. Take the air out of dialogue, but this does not mean rush. Instead, think while speaking. Breaking up speeches and pausing between ideas is the mark of the amateur. A pause in dialogue means something important is occurring or about to occur. Rarely do scenes contain more than one poignant pause, and most need no hesitations in dialogue. This is particularly true in comedy. Yet when auditioning, rehearsing, and even in performance, most actors pause several times and destroy scene momentum. Ready to put this advice to use? Check out our theater audition listings! Want more musical theater advice? Watch below!